U.N. Secretary-General Antonio Guterres is stressing again that the only way the political conflict in Venezuela can be resolved is through political dialogue. Opposition leader Juan Guaido is calling his supporters to take the streets in a show of “great strength and determination” as he makes a return to Venezuela. Guaido came back to Caracas on Monday after more than a week abroad, defying orders banning him from leaving. Guaido went on a multi-nation tour seeking support from neighboring South American countries in his quest to unseat President Nicolas Maduro. Guaido called on people to flood the streets of cities across the country on Saturday to protest Maduro’s hold on power. Guaido landed at Venezuela’s main airport just outside Caracas, saying he sailed through immigration checks. The National Assembly president maintains he is the legitimate interim president of the country because Maduro’s re-election last year was invalid. Venezuelan opposition leader Juan Guaido is speaking to supporters at a Caracas demonstration after he returned to the country despite warnings he might face arrest. Guaido says he returned to Venezuela to renew his campaign to topple the government of President Nicolas Maduro. There was no immediate comment from Maduro’s government about the return of the opposition leader, who has declared himself interim president. Guaido had ignored orders to stay in Venezuela when he left the country last month. Guaido landed at the country’s main airport, about 40 kilometers (25 miles) from Caracas. He said in a tweet he successfully passed through immigration checks. Several European ambassadors who support his campaign for a change of leadership in Venezuela were at the scene as he arrived Monday. Dozens of countries have recognized Guaido as Venezuela’s legitimate leader, arguing that last year’s re-election of Maduro was invalid. Guaido has called for nationwide demonstrations coinciding with his arrival. He’d ignored an official ban on travelling to go abroad. 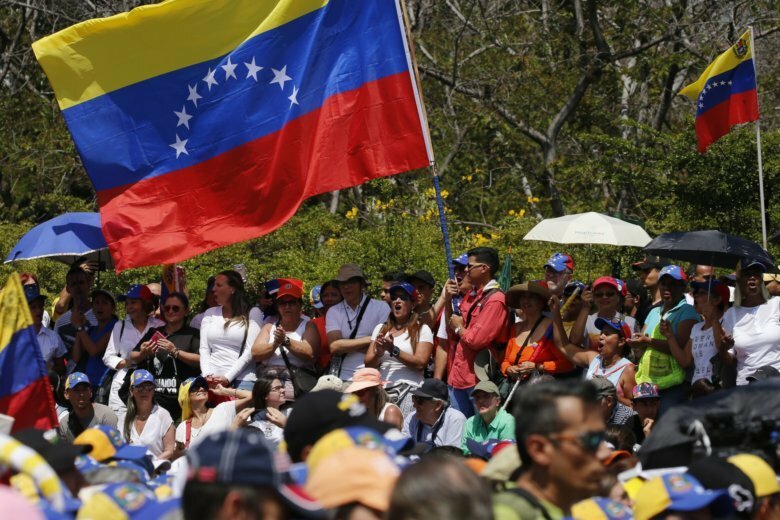 Several hundred supporters of Venezuelan opposition leader Juan Guaido have gathered in a Caracas plaza, heeding a call from the self-declared interim president to turn out for his expected return to Venezuela. More demonstrators on Monday were walking toward the plaza in the Las Mercedes district of the Venezuelan capital. Some carried national flags. The crowd initially appeared smaller than those of previous opposition rallies, which have drawn tens of thousands of people. Guaido says the goal of his return is to intensify pressure on President Nicolas Maduro to resign so that a transitional government can take over and prepare Venezuela for free and fair elections. Maduro says he is the target of a U.S.-backed plot to overthrow him. Guaido on Monday morning tweeted that he was on his way home, though he did not reveal his exact whereabouts. Venezuelan opposition leader Juan Guaido says he’s his way home. Guaido tweeted Monday that he’s heading back to Venezuela, though details about his exact whereabouts remained a mystery ahead of planned anti-government protests. The leader of the National Assembly has declared himself interim president of Venezuela. He says the goal of his return is to intensify internal pressure on the government of President Nicolas Maduro. In the last week, Guaido visited several Latin American countries that support his campaign against Maduro, who was re-elected last year in a vote that the opposition and dozens of foreign nations say was invalid.